" I Dropped a Whole Dress Size In 15 Days & Anyone Can Do the Same Using This Forgotten Method"
You jump from one weight loss program to another, in hopes of finding something that really works. You have been let down time after time and left with a great deal of disappointment, because nothing has ever worked. You are feeling like a failure because you just couldn't lose the weight and started blaming yourself for lack of control. 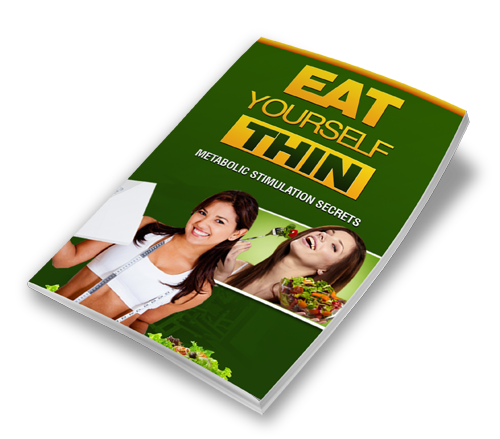 You feel, due to your age, your metabolism is no longer capable of loosing significant weight. The easiest and quickest way to lose weight is by eating the RIGHT FOODS! Eating certain natural foods combined with a well balanced diet will not only help you reduce your weight but also improve your overall health. The secret to losing weight is understanding the difference between bad foods and good foods and the overall effect these foods have on your body. You Owe It to Yourself to Give Eat Yourself Thin a Chance.